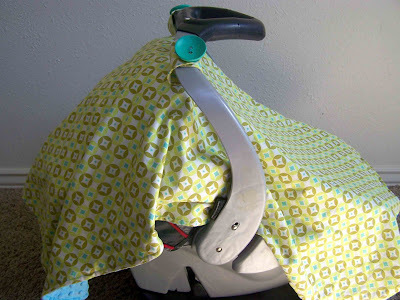 Shortly after Clark graduated from his infant carrier to a big boy car seat (at about 4 months), I started seeing car seat canopies pop up everywhere. 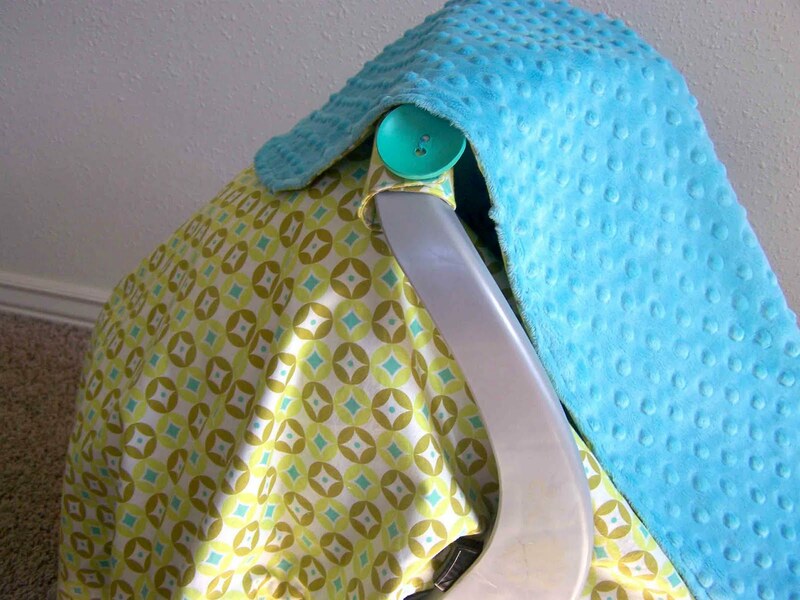 It is such a simple idea, a receiving blanket that attaches to the handle of the carrier. 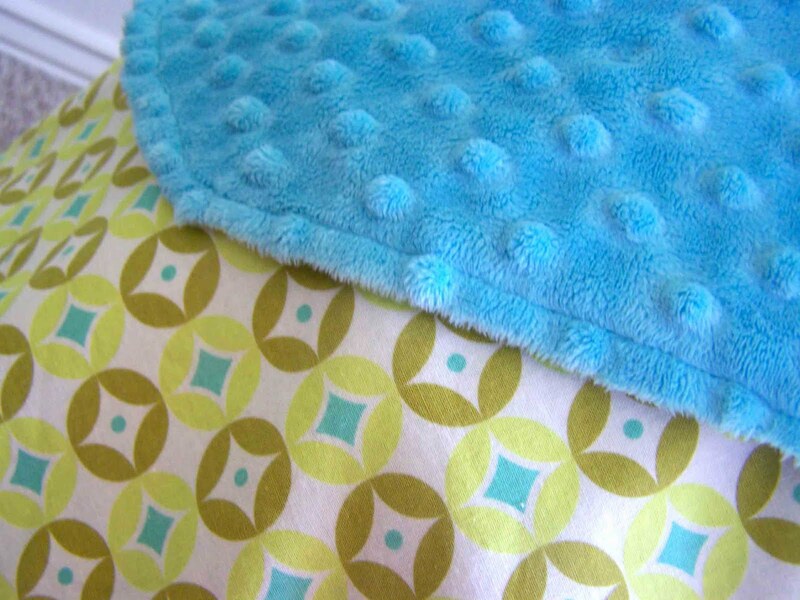 It keeps the baby nice and cozy during winter months, and keeps strangers from touching those precious little cheeks when you're at the super market. I knew that I really wanted to make one for baby #2. I used the fantastic tutorial from Erin of Sutton Grace. You can find her tutorial here. I spent lots of time trying to find the right fabric for the cover. I went back and forth between a few favorite fabrics, but ultimately ended up using this cotton from Riley Blake's Sweet Nothings line. For the inside of the canopy I used an aqua minky fabric that I absolutely love. I'm quite pleased with how the canopy turned out. I do wish that I would have added a couple of extra inches in the length, just to cover any gaps that might occur when transporting the carrier. I'm still debating whether or not I want to add a small window to the front of the canopy. It wouldn't be hard to do, but I'm not quite sure that it's necessary. If you have a baby on the way, one on your hip, or are trying to think up a nice baby gift for a friend-I highly recommend an infant carrier canopy. You could of course purchase one online, but they really don't take much time at all to make. Thanks for reading. I know that the majority of my recent posts have been baby related. I promise that I have in mind to come up with a few different projects. Well, I acknowledge that not all of your readers are pregnant, but I am and I'm loving all the baby posts! :) Thanks for the good link. Just picked out the car seat so now I can find some good fabric to match for a cover. Another great fabric choice!! I'll have to make one if we have another baby. :) PS I don't think you need a little window. Tricia, your cover looks great. I really love the fabric you chose! So cute!